Corri Smith is great at a lot of things, but being goth is not one of them. She's got the style down pat, and has even built her business around the goth aesthetic. But as far as personality goes, she's far from the stereotypical introvert you might expect of a woman who's built a brand around the darkness. Smith is well aware that her chipper nature doesn't exactly mesh with people's preconceived notions about her. "It's almost become like a joke," she says of her goth identity. "Because I'm super upbeat. Once you meet me you're just like, 'Uhhh.'" 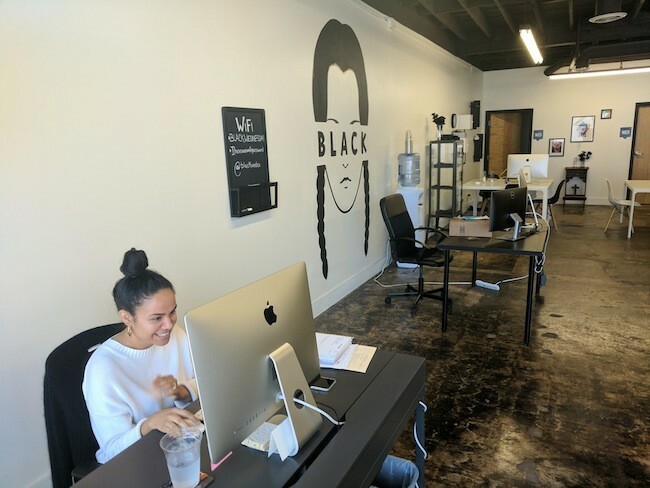 Smith's enthusiasm is contagious, and it's helped her build her business, multimedia marketing company Black Wednesday, into one of Charlotte's most recognizable brands. But why all the black? Smith says her affinity for the darkness came from a desire to branch out following a childhood defined by stifling conformity. Growing up in Ashville, New York, a hamlet near the border of Pennsylvania with a population that barely surpasses 3,000, Smith says there was never any thought of creating her own style. "There was nothing where I grew up that would allow you to see anything that was different and/or engage in being different," she says. "You were just there. There was no outside the box. My family was outside the box because we were Catholic and everyone where I grew up was Methodist. So we were already as far out of the box as we could be in being raised Catholic, and that was it." After graduating high school with the same 70 classmates she'd known since kindergarten, Smith attended SUNY Geneseo, where she began finding her own style and accumulating the tattoos that now adorn her arms and legs. Once she graduated college, she came to the South to escape the brutal winters of southern tier New York, and after working in public relations at the Music Factory for some time, she decided to strike out on her own by founding Black Wednesday. The name is a nod to one of her favorite fictional characters, Wednesday Addams. Now Smith is preparing to celebrate Halloween with "A Party To Die For," an exclusive party for Black Wednesday friends and family, and a few lucky Creative Loafing readers, on Oct. 31. We're giving out two tickets for the party to one CL Twitter follower and another two to one of our Instagram followers. All you have to do is tag us and Black Wednesday's account in a pic of Smith on this week's cover and you'll be entered to win. Halloween has always been Smith's favorite time of year, she says, and with the holiday landing on an actual "Black Wednesday" this year, she's cooking up some special plans for the tarot-themed party — some of which she wouldn't even let us know about. Smith says she threw down so hard for the company's three-year anniversary party in April that folks are expecting her to match the experience. "I really screwed myself with that party because I had a tattoo artist come and he tattooed anybody who wanted it," she says. "So I nailed myself to the wall with that party though, because everyone's like, 'Oh, so what are you doing for your Halloween party?'" Smith may throw a great party, but for the most part, she's all business. She estimates an average workweek to be about 90 hours, and she's never truly off when it comes to helping build consistent brands for her 25 clients. But it's the job she signed up for, and she wouldn't have it any other way, she says. "I have people telling me all day long about work-life balance and you should only work 'X' hours a day and all this stuff and, ya know, everyone's different," Smith says. "As much as I say, 'Great, enjoy your PTO and your 401K or whatever,' you should respect that I don't want those things and that I work like a crazy person and I love every second of it. So the 15-hour days don't feel like 15 hours." Her team of three fulltime workers and three interns covers a lot of ground, including social media, marketing, public relations, event planning, graphic design and more. When we visit Black Wednesday on a Friday morning, the workplace isn't as hectic as Smith's busy schedule might imply. 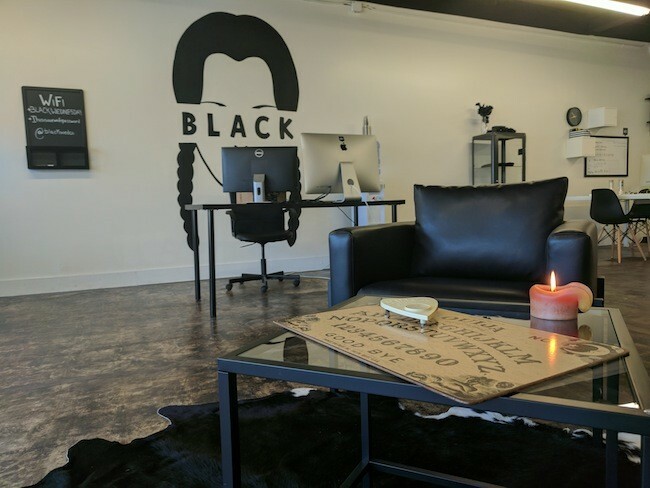 The Black Wednesday brand is in full effect, though, with candles lit throughout the office and a Ouija board sitting on the first table anyone sees when they walk in. 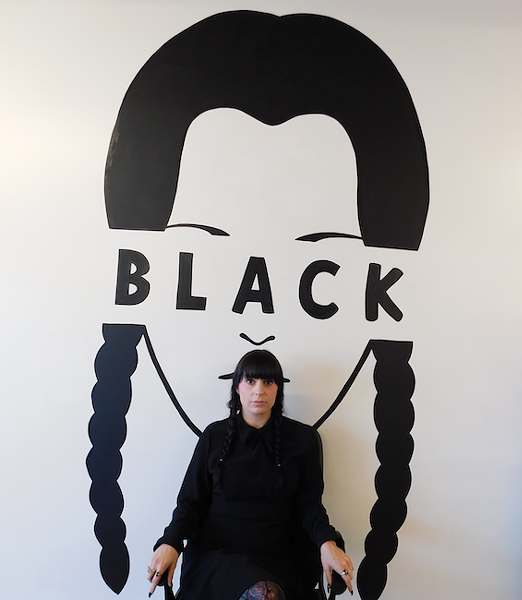 On the wall, a logo portraying the likeness of Wednesday Addams over the word "BLACK" centers the room. 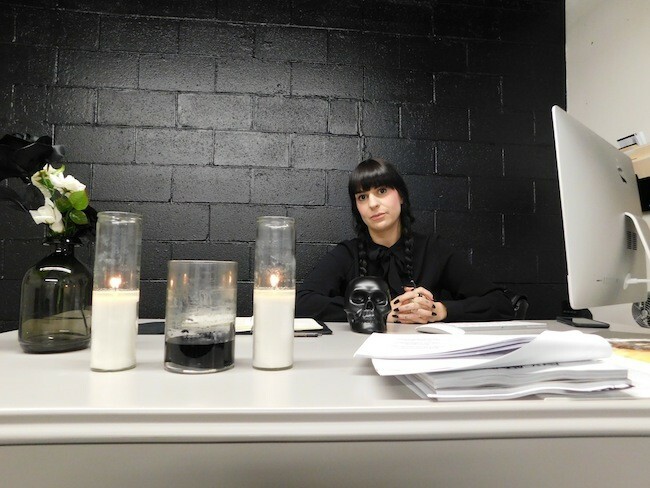 Throughout the office, skulls and black flowers adorn shelving units, and a pew from a church gives off gothic vibes. Smith is dressed in a black dress she pulled out specifically for the cover shoot — she even wore pigtails to best honor the namesake of the company. Though her sense of style is undeniable, Smith contends her appreciation for black came mostly from convenience. "I really don't care about clothes, and I can just put on something black and I know it looks good and it translates no matter where I am and I look OK. That's sort of where it became really easy," Smith says of the reputation she got as a goth. "So people started to package me as goth. So I was just like, 'Whatever. If you want to tell people I worship the devil, I don't really care.' And I just sort of went with it, and I think I really took ownership in just being different." It was brand-building at its best, and that's what she takes into her work. Smith isn't just focused on building brands for her clients, she has to make sure the Black Wednesday brand itself stays relevant. She does that through creating trends like the #BlackWednesday hashtag, which followers use when they post pics of themselves decked out in black on Wednesday. She also publishes her own content through the company, including continuous 13-week series like #ItsReallyMeCLT, which showcases the work of 13 different social media managers behind strong brands in the city. For a past series called 13 Shades of Black, Smith showcased 13 local folks in the fashion industry, featuring a new person each week in a photo shoot all decked out in black, and put them on the local news each week. It's a way to highlight people doing things in the community, but also to show off what her business can do for clients. "The 13-week series came out of, one, our need to tell the Black Wednesday story, but two, we also need to lead by example," she says. "So if we're out telling people they need to create stories and create buzz and help people see what they're about outside of just promoting themselves, then we have to lead by example." Evelyn Flores, Black Wednesday's lead social media manager, has worked at the company for two years. Before that, she was an IT recruiter at a business in Uptown Charlotte. She met Smith when she was featured in one of Black Wednesday's 13-week series. She was recognized for having one of the city's best Twitter accounts, which set her up nicely as a favorite for the new position when it opened up. Flores says her favorite part of the job is seeing the photos from Charlotteans who tag the company in selfies with their black outfits on Wednesdays. She's recently been taking on more PR work for the company, as a new social media consultant joined the team within the last month. Similar to Smith, she wouldn't trade her heavy workload for anything, she says. "I work all the time, but it's fun work so I don't really think about it as work, versus before when I was in a super corporate environment," she says. "It's just a lot different doing stuff that you actually like to do versus stuff you have to do. I guess the biggest difference is that I'm doing creative things that I wouldn't have had the chance to do at my recruiting job." Flores' new responsibilities include training the newcomer, Alicia Broughton, who applied for the position after becoming too spread thin at her past job, which included doing social media for many different clients at a PR firm in Charlotte. She says her first month at Black Wednesday has been a refreshing new start. "Here I have the opportunity to essentially be the brand, whereas I was not giving everybody 100 percent without working 50 hours a week [at my past job]," Broughton says. Smith is currently looking to grow the team even further, as she'll be hiring a part-time administrative assistant. But it's not all work and no play at Black Wednesday, as Smith prepares for a party to live up to the expectations of her company's cult-like following. While she's still secretive about the one big feature of the party that she hopes will upstage her free tattoos in April, there's still a shot that you can be there in person to find out. We'll see you on social media.